The Triassic period was a fascinating period for mega-fauna. While we haven't discovered giants equal to the Brachiosaurus of the Jurassic age, this was the era in Earth's history that saw the 10m long, 2 tonne Antetonitrus shaking the ground. In the oceans you could find the 4m long Ichthyosaurs, dolphin-like predators that could move at 40 km/h. These warm-blooded reptiles are generally assumed to have been at the top of the marine food chain but they may have had an artistic competitor. It could seem strange to apply the word 'artistic' to a Triassic creature but an in-depth examination of Ichthyosaur fossils has renewed the general confusion about what happened to the animals on display at Nevada's Berlin-Ichthyosaur State Park. The major issue is the arrangement of the fossils. They appear to have been placed purposefully in a pattern that would not suggest a random event. We can see fossils grouped and set in lines. This would require some unusual water currents to happen by chance. In the 1950s, the expert Charles Camp was puzzled by the situation leading to the death of these animals, and even today we cannot be certain whether the dinosaurs died in shallow or deep water. Whatever the depth of the water, the configuration of bones is not easily explained. One theory, suggested by Mark McMenamin a palaeontologist at Mount Holyoke College, is that a 'kraken' was responsible. He says that this kraken killed prey and then brought the remains back to one site where the bodies were placed carefully. The kraken is a beast of mythology, a giant cephalopod, able to destroy ships and pull sailors down to the watery depths of the ocean. Many people would be quick to dismiss this as fantasy but McMenamin posits that the kraken might have a genuine Triassic equivalent. 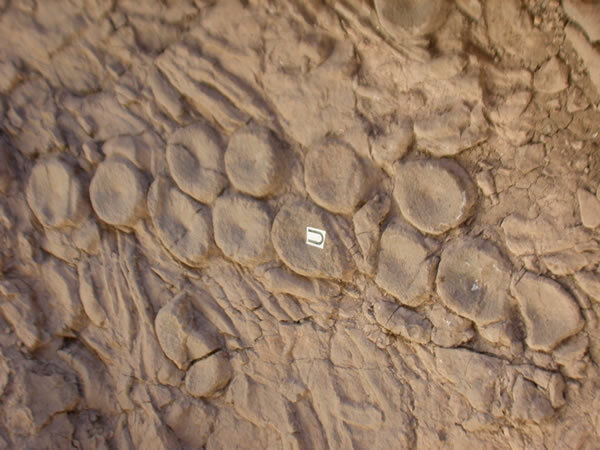 To support his theory he points to the arrangement of vertebral disks in the fossil bed. They bear an uncanny resemblance to the coleoid suckers found on the tentacles of cephalopods. If McMenamin is correct then this must be some of the world's first representative art! If we look at modern equivalents we can see some parallels. Modern-day octopuses have been known to hunt smaller sharks, and their intelligence is surprisingly complex, but an octopus that creates imagery with bones is harder to believe. That will require some further evidence before it is accepted by the paleontological community.